OK. I’m frustrated and that is why I’m posting right now. I’ve got a ton of gadgets. I love technology. I just spent the last 40 minutes doing something that should have taken me 3 minutes. So, I’m in my living room which has an old school stereo amplifier/receiver connected to speakers. 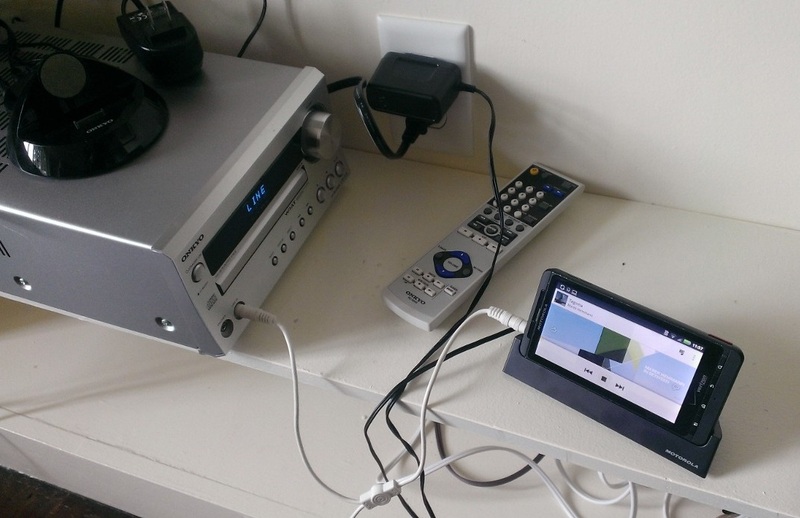 I’ve rigged it up with a Motorola DroidX and docking station with audio-out connected to the audio-in on the amp. The goal, when guests come over, I can turn on the music and provide entertainment. Or if I’m hanging out in the living room, I can listen to some music. The DroidX is an old 3G phone that I don’t use anymore as a phone since I now have a Droid 4 (4G) and an HTC 8X (also 4G) that I swap the sim card between. The DroidX receives music (theoretically) through Wi-Fi. So after a failed attempt a couple of weeks of playing some Sascha Funke at a dinner party a week and a half ago (the DroidX kept freezing up), I ended up getting it to work a few days ago. Well in my living room today I launched Google Play music and found Sascha Funke. It then came up with a new song called Acrobat, which I decided to listen to. It was a great song and then decided to kick off the “radio” feature that Google just added a few months ago. This feature is similar to Pandora. Basically you choose an artist or song and launch into a customized radio station. Well after a couple of false starts (not sure if it is a weak Wi-Fi signal or just buggy software) it finally launched a song that I completely disliked, so I clicked the “next” button. Then came a really cool song, not right away, I fast forwarded 30 seconds into the song and it started playing. 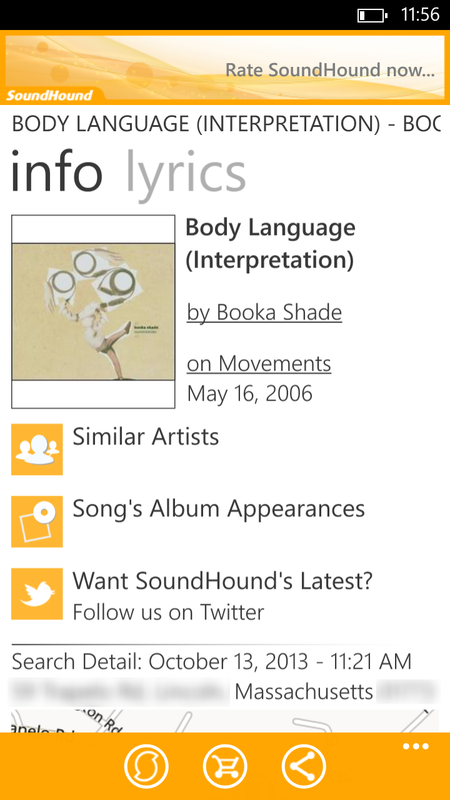 The song was Body Language (Interpretation) by Booka Shade. Never heard of Booka Shade, but loved this song. So I clicked the “thumbs up” icon in Google Play’s interface to indicate that I liked that song. I didn’t want to interfere with this fragile technology, which was working, so as I listened to the song I decided to use another piece of technology to remember my “like”. See, I started to think about if I could access my thumbs up from Google Play in the future so I can remember this song and thought that that might be impossible or difficult, and since I’m considering canceling my Google Play subscription, I may loose that data by canceling even if I can access it now. So to be on the safe side, let me record this moment in time on a redundant system. 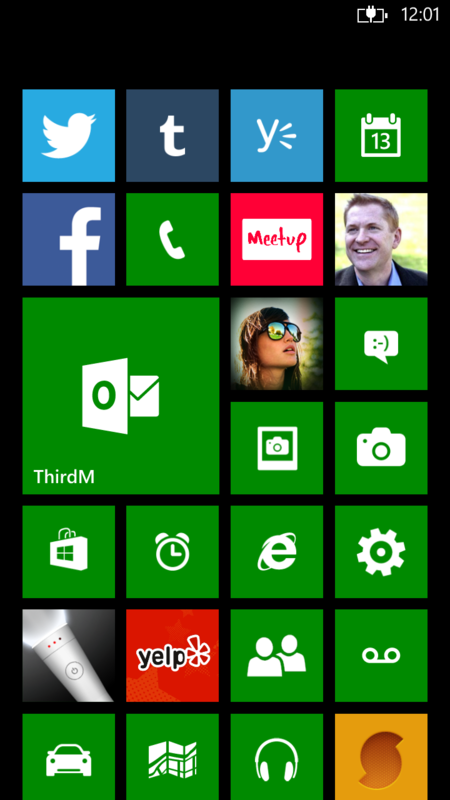 So I whipped out my trusty HTC 8X (Windows Phone 8 device that I’ve been using as my primary phone for months) and launched into SoundHound, which I keep handy on my front screen as a tile just for this type of occasion (SoundHound is the yellow tile in the bottom right corner of the screenshot). The user interface is great, because the startup screen to SoundHound has a nice big button that says “WHAT’S THAT SONG?” and “Tap Here” in big letters. Pressing it brings up the “listening…” interface (this is similar to Shazam, if you are familiar with that app). By the way, I use Shazam on my Google Android phones and iPhones, but since Shazam is not available for Windows Phone, I use SoundHound on my Windows Phone. The first try is unsuccessful. For good measure, I click the identify song button again. This time it worked! SoundHound successfully identified the song that was playing so now I can save it on Twitter, Facebook, and SoundHound so I can retrieve it at a later date. Ok, now we are getting somewhere. So I click the “Share” button and clumsily type a message to post on Twitter and Facebook about how I found this song and that I like it. But when I share it, it fails. Something about a bad network connection. So I try again, this time just to Twitter. Similar message, can’t log in, check your network settings, blah, blah. So I try again. Each time diligently type my message it gets more refined, the first time I just say “Google Play”, by the third time I’m now using a hashtag “#GooglePlay”. Another failure. 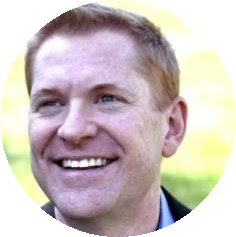 FRUSTRATION starts to enter, but being a software developer, persistence endures and eventually pays off. So I walk upstairs to my office to use a third technology, my standing workstation that I’m writing this blog from, which consists of a 3 year old Gateway FX computer with two monitors. Now I start checking my spelling of Sascha Funke, which I had been leaving off the “e” at the end of Funke. I also verify that Acrobat is the correct song and was spelled correctly. Now I’m standing 3 feet from the Wi-Fi router and think that might help this tweet/Facebook post commit. Nope. Ahh, I found in my phone it was using the Wi-Fi access point in the basement. Reconfigured my phone to use the Wi-Fi router 3 feet away and tried again. Nope. Check my Facebook feed and Twitter feed from my desktop computer to see if anything is getting posted. Nope. Change the phone settings so Wi-Fi is turned off so it uses the cellular signal. Nope. Now I try going into the SoundHound settings. 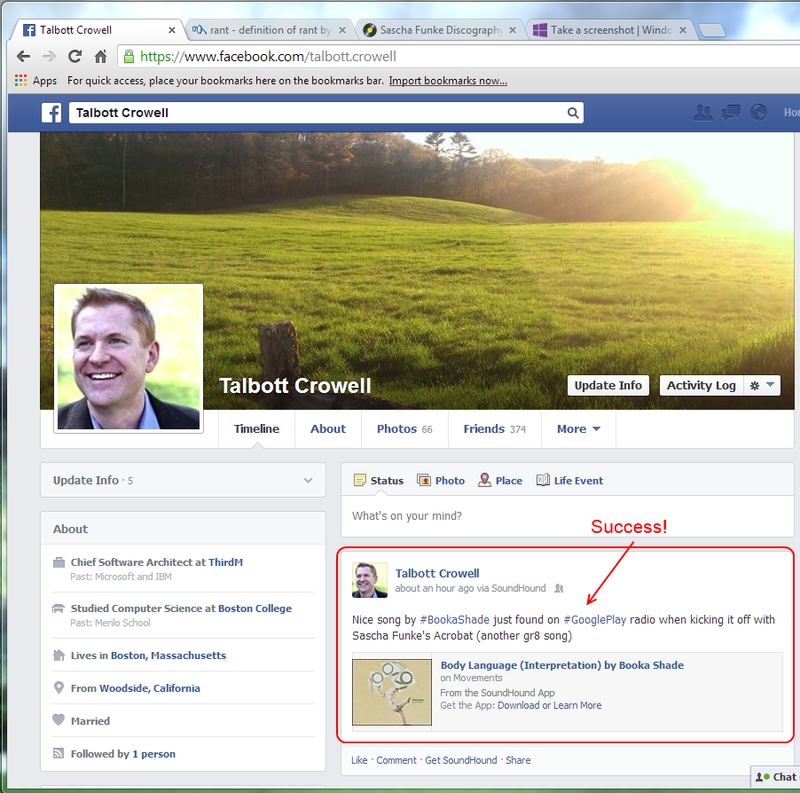 Found the Twitter and Facebook integration settings and log out of both, and log back into both. Post again and still get the error, but after viewing both Twitter and Facebook, I found that Facebook posted, yeah, a small victory. OK, so by now, I have typed the same message (more or less) at least four times on a little touch phone interface and have succeeded (more or less) in making my memory of this song a bit more resilient. No tweet, but Facebook is good enough for now. But, retyping the same message over and over, I now will probably remember how to spell Sascha Funke, and might even remember this new artist called Booka Shade. One thing for sure, the Google Play is going to have to go. The radio stopped right after that song and never played the next song. I started with Google Play a year ago when it was free. Uploaded all of my music (for free) to Google Play to store for me as a back up. They allow me to now stream that music from any device that will allow Google Play (basically my Android based phones or a browser). But after Google’s new launch of the radio feature in May of 2013, they started charging my credit card $9 a month. One more subscription I don’t need, especially when Pandora is free. Isn’t technology grand? It’s such a labor saver.